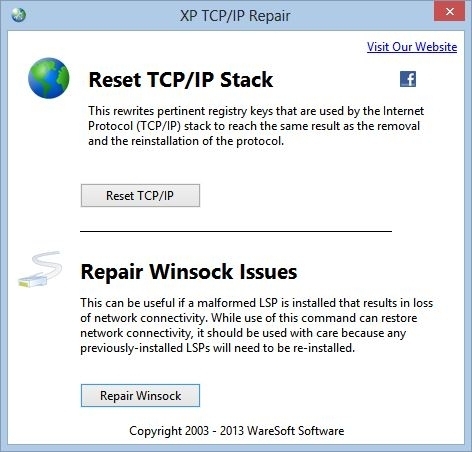 Is Spyware andor Adware messing up your internet connection after you have uninstalled it Has your internet connection slowed down and you just do not know why Have you used an Internet Optimizer that just did not optimize your internet Instead it made it slower If you answered yes to any of the questions above then XP TCPIP Repair may help fix your internet connection and possibly even protect your privacy. 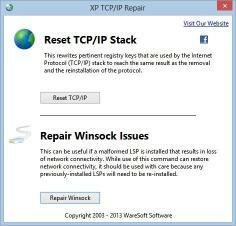 XP TCPIP Repair is a Graphical User Interface (GUI) for commands in Windows XP and up that repair your TCPIP registry settings and your Winsock LSP settings. Instead of having to remember long confusing command line options you can now just click a button. What is an LSP Layered Service Providers (LSP) are small pieces of software that can be added or inserted into the Windows TCPIP handler by other software. Data outward bound from your computer to a legitimate destination on the Internet can be intercepted by an LSP and sent somewhere other than where you intend it to go. Added support for Windows 8. Updated installer and links.